Photo copyright by John Divola. 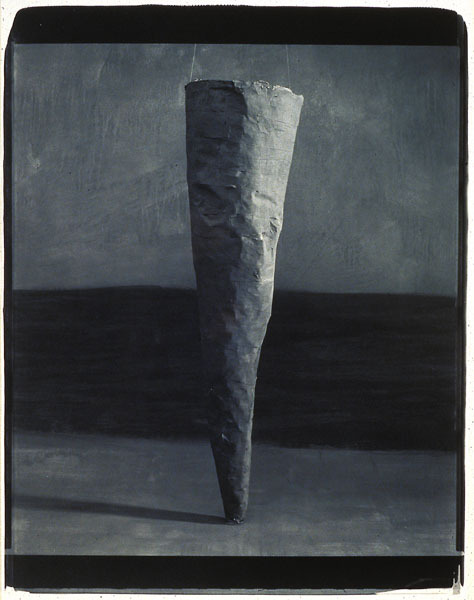 “Echo Chamber”, an exhibition featuring unique photographs created by John Divola in the late 1980s, is currently being exhibited at Gallery Luisotti. A central component of the exhibition will be a number of 20×24” Polapan prints made at the New York Polaroid Studio in 1987, 1988, and 1989; a pair of related large-scale gelatin silver prints will also be on display. What becomes clear to viewers of the images in “Echo Chamber” is that Divola works between media. He melds sculptural and painterly constructions with photography’s capacity as a documentary medium. The resulting images are visual contemplations of photography’s relation to time, and humanity’s relation to the cosmos. 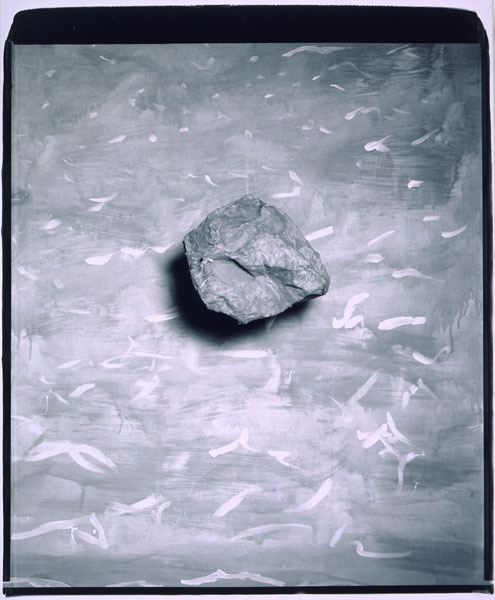 By the late 1980s, John Divola had developed a unique grammar within his photography. In bodies of work from the 1970s, such as the color Zuma series, or the black and white Vandalism, Divola used his camera to document domestic interiors at the brink of demolition. He favored subjects that could be seen in photographs, but were approaching absence in reality. In order to provoke this difference between photographic stillness and lived time, Divola often marked the spaces he photographed with spray-painted gestures, ad-hoc sculptures, and pronounced artificial lighting. These alterations to reality were not meant to manipulate the viewer so much as to draw attention to the differences between photographic permanence and the disappearance of lived reality. The photographs featured in “Echo Chamber” furthered Divola’s exploration photography’s essential condition. In Divola’s words, written about the Polaroids featured in “Echo Chamber,” “the photograph as an object has an relationship to that which it represents something like the relationship the snake skin has to the snake that sheds it. The relationship of something dead to something living.” The Polapan prints especially lend themselves to this associate with skin. Their plasticity and their alchemical marks bear witness to a mysterious process of creation; their subject matter conjured up, and then discarded. 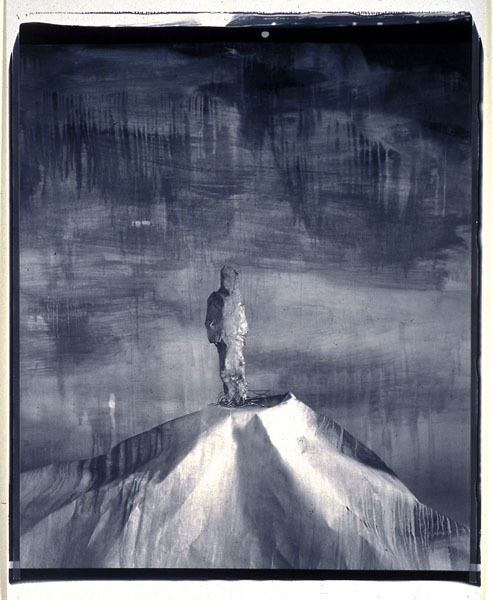 Divola’s “studio constructions,” as he called them, were temporary structures made solely for the purpose of photographic depiction, including funnels, human and animal figures, and expressively painted backdrops. Divola’s photographs are themselves echo chambers: they replicate and reverberate light from objects that have long since vanished. Divola’s process has important photo-conceptual precedents: Richard Long’s photographic records of lines made by walking, Jan Dibbets’ play with optical illusion through the camera’s lens, or Robert Smithson’s Yucatan Mirror Displacements. 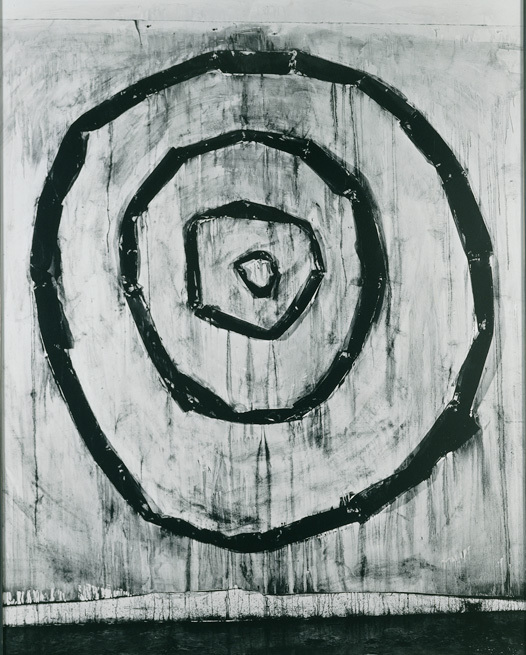 Divola’s work, though, is equally in conversation with the work of Jasper Johns. Johns, known for his paintings of numbers, flags, maps, and targets, focused on flat subjects as a means to conjoining the surface of subject matter with a painting’s flat picture plane. Divola has transmuted the achievements and medium-specificity of high modern painting into images that explore photography’s mimetic qualities and its sheer surface. These are images are about a recognizable reality we cannot access, dim echoes of a familiar world, yet one that has vanished. For more information about the exhibition and artist please contact the gallery directly.